There is abundant evidence that companies with women in senior leadership and board positions are more successful than those without. However, in the wake of movements like #MeToo and #TimesUp, it’s tempting to double down on preventing sexual misconduct as a top priority. Which, while not wrong, places more emphasis on protection than empowerment. What if your company focused on creating (or shoring up) a workplace culture that develops and champions its high potential women? What would be the impact if your organization established a robust pipeline of skilled and confident female leaders - who were ready, as opportunities arose, to move your company forward? If your company is not championing women to lead (and live) into their highest potential as leaders, your emerging female leaders are probably not advancing within your organization the way they, and you, want. This is simple to rectify. Your high potential women can immediately amplify their communication and leadership skills - and you don’t have to send them off-site to do it. 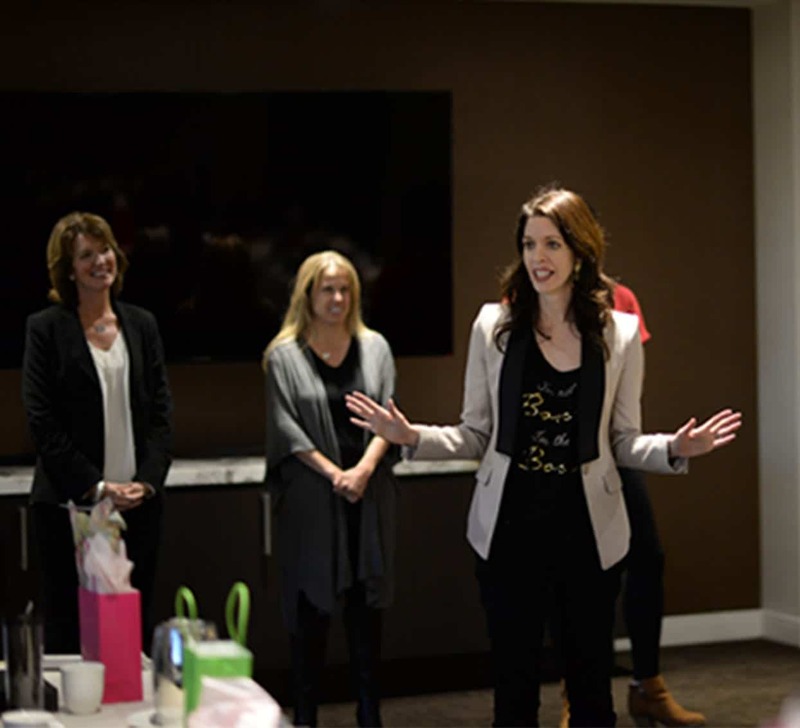 Step into Your Moxie® is a yearlong, experiential leadership development program designed so that your top performing female employees develop the mindset and skill set to speak with power and impact and move people to take action on their ideas. The holistic, women-centered curriculum focuses on setting participants up for multi-layered success. Through mastering their own self-leadership and practicing the nuanced skills of communication, persuasion and negotiation, program participants will dive deep into their own thinking and behavioral patterns and role play different types of relevant communication and leadership scenarios. They will emerge more cohesive as co-workers and eager to bring their new learning and habits to their roles within your company. Participants identify and address real and self-imposed barriers that diminish their self-confidence and prevent them from using clear, confident and compelling interpersonal communication and leadership. Next, they clarify their “secret sauce” as leaders, how they want to be seen by colleagues, and illuminate the core values that drive their goals, performance and decision making. Through a range of fun and effective improvisational exercises, participants weed out vocalized thinking, enhance their capacity for strategic risk taking, and banish the fear of failure - once and for all. Participants develop the mindset and behaviors to consistently speak with power and impact. They learn the anatomy of a “daring conversation” and develop the muscles to use heart-centered, high-impact communication when stakes are high, emotions are strong and opinions differ. Exercises provide participants real-time practice using communication that meets people where they are (whether influencing up, down or across), makes them feel heard and validated, and translates into the intended action - whether the situation is a performance review, delivering bad news or navigating through real or perceived conflict. Participants learn to present dynamically - whether to staff, clients, funders, internal stakeholders and community partners or at conferences and industry events. From how to integrate storytelling, humor and strategic vulnerability to best practices for selecting and structuring speaking content that is clear, compelling and actionable, participants discover how to lock into unshakeable, authentic speaking presence when they speak - irrespective of audience size. Additional training and role-play practice prioritizes sculpting a message quickly in impromptu speaking situations, demonstrating credibility and know-how (without puffing up or posturing) and using body language and personal style that aligns with one’s speaking and leadership style. In this session, participants compile and practice using words, phrases, questions and gestures that heighten their persuasiveness and make asking for what they want something they look forward to, initiate and excel in. Participants learn the key components of developing and presenting an impactful persuasive case across professional contexts. Particular attention is paid to rehearsing for negotiations, setting all parties up for success, using direct communication, responding both to anticipated and unforeseen resistance, and finding creative ways to get all parties on board with a proposal. Traditional professional development, even in the women’s leadership space, often privileges conference-style learning, inspirational speakers and mentorship. While these mediums have their merits, they don’t address the primary ways that women learn, practice and implement new skills. Role play, rehearsal and real time feedback and coaching help women boost their sense of worthiness and ultimately enable them to transfer their learning into higher leadership aspirations and sustained leadership performance. Getting up on their feet, being able to take risks, fail and try again develops real world leadership skills in the way women learn best - in a way that sitting in a conference, or even being mentored, simply can’t. Developed and led by Alexia Vernon, the Step into Your Moxie® curriculum incorporates Alexia’s mix of quirky humor, authentic vulnerability, and poignant storytelling. Women emerge having solidified the mindset, skills and behaviors they need to become the leaders that will make a real impact on your organization. Ready to build and sustain your female leadership pipeline? Please email Stephen Oliveira at stephen@alexiavernon.com to schedule a call to talk about how you can champion your high potential women.